Despite the small size of the graveyard there is quite a variety of habitats and microhabitats present that provides homes for many species of wildlife. The great majority of the graveyard though consists of an area of quite tall semi-natural grassland. 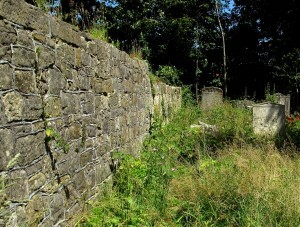 Surrounding the graveyard and church is mainly woodland edge although one side of the graveyard is edged by a sandstone wall. 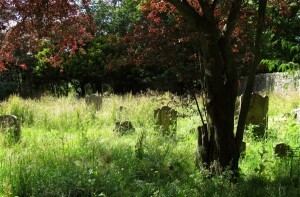 Within the meadow and amongst the surrounding woodland there is some dead wood habitat and the gravestones and church walls themselves are also an important wildlife habitat. The grassland within the graveyard has obviously developed naturally over the years but has been cut and seeded in recent years creating a tall meadow habitat. The meadow has been seeded with an arable margin mix that includes many scarce arable plants, such as corn marigold, corncockle and alsike clover. These species are either very rare in the wild or approaching extinction. 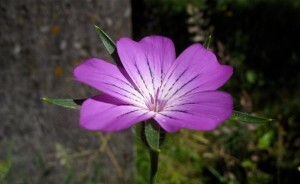 The graveyard is therefore one of the very few places, if not the only place locally, that many of these arable plants can be seen growing in a semi-natural habitat. More information about the botanical diversity of the meadow will be available in the wildlife section. Woodland Edge & Dead Wood. The woodland surrounding the graveyard is semi-natural woodland consisting mainly of sycamore, field maple and ash, with some yew and planted norway maple and red maple. A large badger sett dominates the woodland floor on one side of the graveyard and some cut tree trunks provides valuable dead wood habitat. The woodland edge was used by many of the bird species recorded on the wildlife survey, conducted during July 2012. More information on bird species recorded will be available in the wildlife section. 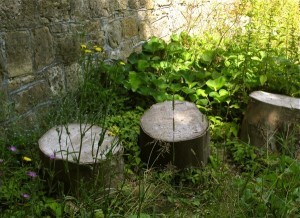 Some of the cut tree trunks have been placed in the meadow and used as seats. They provide a very valuable habitat for species of solitary bees and wasps and a couple of species were observed during the survey. The combination of dead wood breeding habitat and nectar producing plants in the meadow is very important for many species of bees, ants and wasps. The sandstone wall edging the graveyard and the church walls themselves provide habitat for a lot of wildlife most importantly solitary bees & wasps and lichens. 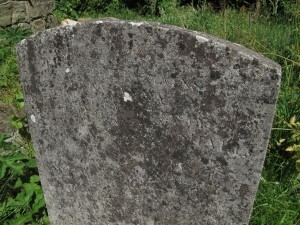 Gravestones are a very important habitat for lichens and the gravestones within the churchyard are home to a number of species of lichen. More information on the species recorded from the gravestones and sandstone walls will be available in the wildlife section.